Guinea-Bissau is one of the poorest countries in the world. Years of political instability and economic stagnation have had a serious impact on the health system. A former Portugese colony, the West African country of Guinea-Bissau is home to 1.9 million people. Since independence in 1974, the country has been subjected to considerable military and political upheaval. The country is one of the largest producers of cashew nuts, which provides a modest living for farmers and is the main source of foreign exchange. 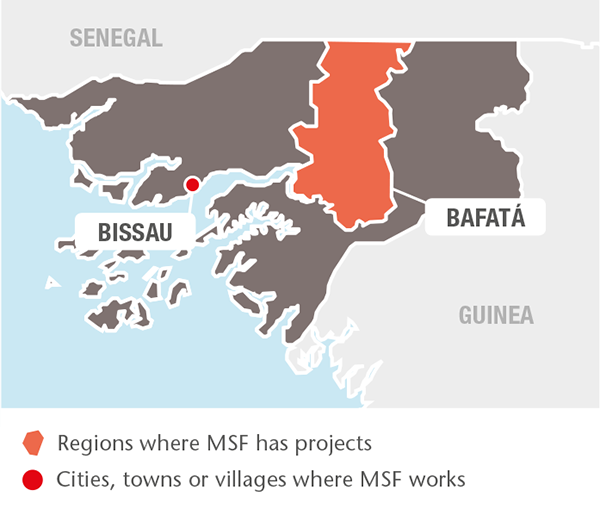 Médecins Sans Frontières/Doctors Without Borders (MSF) first worked in Guinea-Bissau in 1998. Our work in the country involves responding to endemic and epidemic diseases. In the central region of Bafatá, MSF continued working to reduce childhood mortality by managing the regional hospital’s neonatal and paediatric wards, and running a nutrition programme for children under 15 years of age. Teams also supported four health centres in rural areas and trained community health workers to diagnose and treat diarrhoea, malaria and acute respiratory infections, and to detect and refer patients with malnutrition. They also operated a hospital referral system. 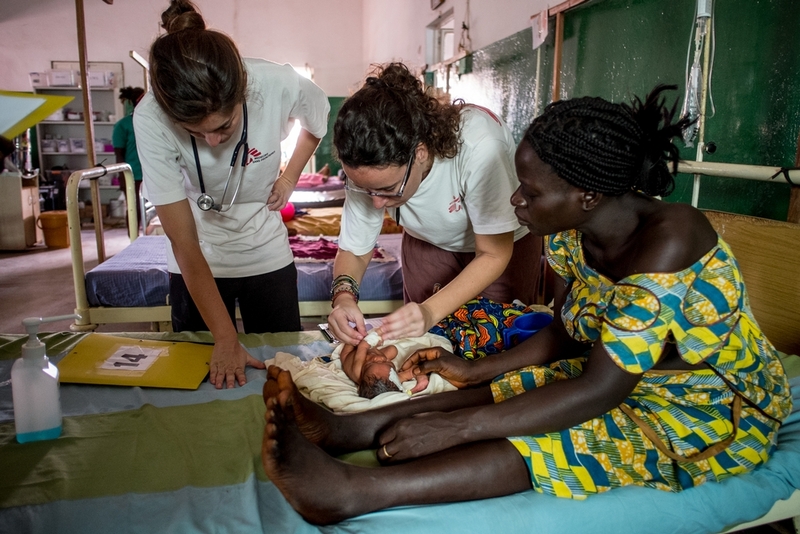 MSF nurses working in the paediatric department of the Bafata regional hospital. 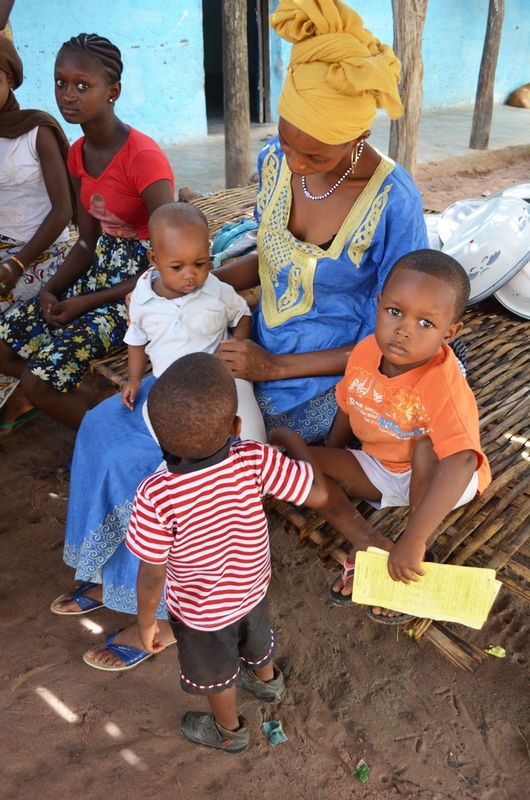 MSF doubled the bed capacity of the regional hospital during the peak malaria season and, as an added preventive measure, implemented a seasonal malaria chemoprevention (SMC) strategy for the second year running, reaching 21,000 children in Bafatá. As a result of the team’s advocacy and training initiatives, funds were allocated for SMC in other regions of Guinea-Bissau. In Simao Mendes national hospital in Bissau, MSF supported activities in the paediatric intensive care unit and, from September, provided 40 beds in the neonatal intensive care unit. The team worked closely and successfully with the Ministry of Health’s paediatric and maternity services to reduce the very high child mortality rates in the units, which were mainly due to neonatal sepsis, lower respiratory tract infections and malaria. Measles vaccination in Bafata, Guinea-Bissau.